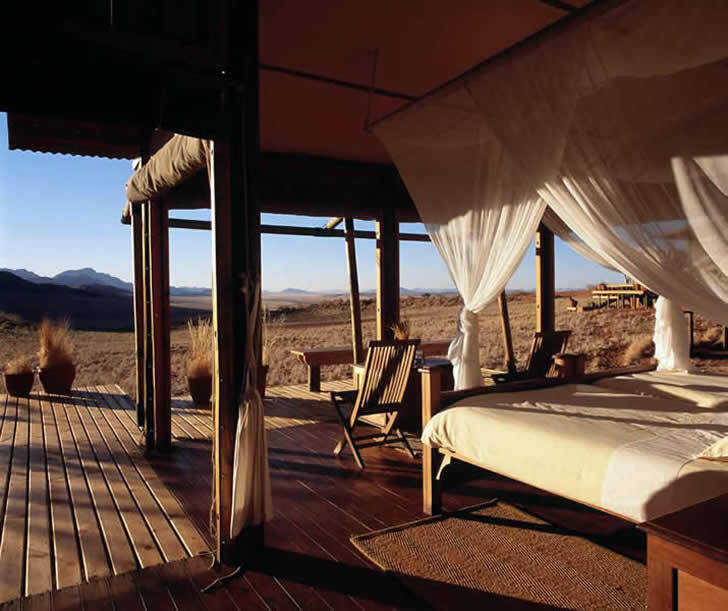 Wolwedans Dunes Lodge, perched on top of a dune plateau, and Wolwedans Private Camp, set in the hushed seclusion of a valley, have both been guided by the aesthetic principles of simplicity, utilitarianism and unparalleled contact with the elements. 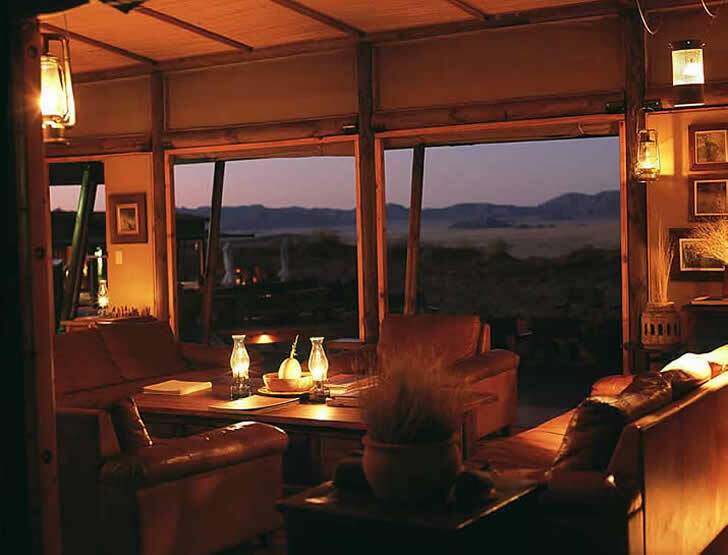 To describe the locations of the several camps that make up the Wolwedans Collection of lodges as �remote� might come across as the ultimate understatement; after all, they are situated in Namibia�s vast desert environment. But even deserts can become too overcrowded for those seeking true solitude. 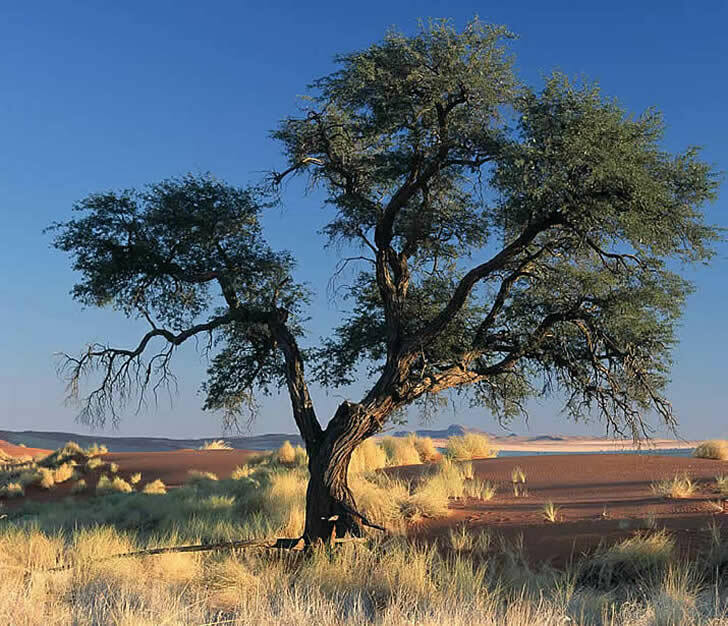 The NamibRand Nature Reserve is a place of utter seclusion thanks to it being largely overlooked by the tour buses and self-drive 4x4 crowds who instead opt to visit its better-known and somewhat more accessible counterpart, Sossusvlei. This is a virtually untouched part of the world that comprises several habitats, from the shrubby desert grasslands and surging red dune belts to rocky mountain outcrops tinged violet by the setting sun. Wolwedans Dunes Lodge and Wolwedans Private Camp find themselves in the midst of all this serenity, ably fulfilling their function as welcoming shelters that stand in deference to the austere beauty of the landscape. In creating Wolwedans Dunes Lodge and Wolwedans Private Camp, Stephan Brueckner (who is the owner, chief designer and managing director of the Wolwedans Collection portfolio) has created two equally appealing destinations that engage in an active dialogue with their settings. Wolwedans Private Camp is the more intimate of the two, a self-contained stand-alone �suite� accommodating no more than four guests and comprising two bedrooms, two bathrooms, indoor and outdoor living rooms and an open-plan kitchen. The building takes the shape of a low-slung cabin and is constructed of wood, a corrugated-iron roof and canvas sheets that replace fixed windows and roll up to reveal the straw-coloured grass plains outside. Decor is classically inclined: deep leather couches, warm colours, paraffin lanterns and collectibles redolent with history evoke a home-from-home atmosphere. The emphasis here is on relaxation and privacy. Browsing the well-stocked library, taking solitary walks on the plains, luxuriating in afternoon naps on the shaded veranda and enjoying the languorous preparation of one�s own meals (all food and beverages are supplied) are the stressfree activities that occupy those who choose to include Private Camp on their Wolwedans agenda. Visitors from more pampered backgrounds have the option of requesting the services of a private chef and personal field guide, should the thought of going it alone prove too daunting. Wolwedans Dunes Lodge corresponds to Wolwedans Private Camp in its use of the same fundamentally simple materials and cleanlined architecture. One of the lodge�s most dramatic spaces is the Mountain View Suite, a pagoda-like structure set away from the main camp and exposed to nature on all sides. The architectural simplicity of the chalets is continued in the main complex, which consists of an inviting series of lounges, sun decks, pool, communal fireplace, tea deck, library, wine cellar and two dining rooms. The decor here is slightly more layered and colourful than in the private areas and reflects a colonial-chic sensibility. A palette of ochre and sand forms the ideal backdrop to traditional and unpretentious pieces: deep leather sofas, dark wood furniture, a handsome collection of antiques and the lodge�s signature paraffin lamps, which allow the stars in the night sky to garner their due attention.